The new Yamaha MT-15 has started to arrive at the dealerships, and the test rides for the motorcycles have commenced at select outlets. 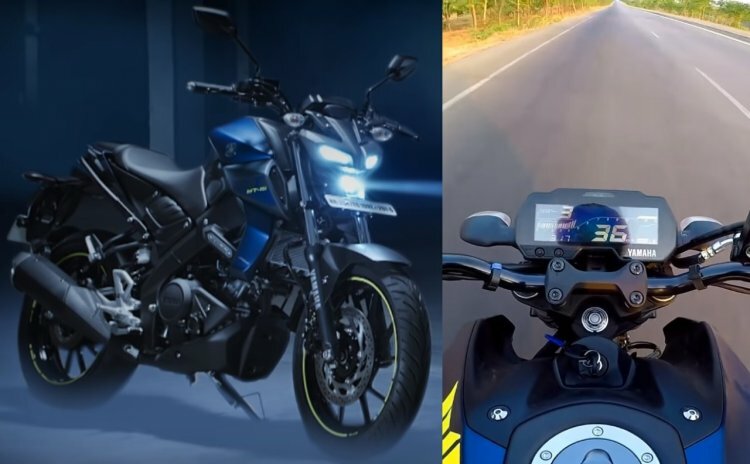 We stumbled upon a YouTube video that was captured during the test ride of Yamaha’s latest product in the Indian market. The video footage captured the top speed and braking performance of the new MT-15. As seen in the video, the Yamaha MT-15 clocks a maximum speed of 128 kph (speedometer indicated). In comparison, the Yamaha YZF-R15 V3.0 has a claimed top speed of 136 kph. As you would have noticed, the tachometer had a few more revs before the redline. In terms of braking, the naked roadster comes to a standstill from 63 kph in less than two seconds. Do note that the motorcycle comes standard with ABS. However, unlike its fully faired sibling, the YZF-R15 V3.0, the MT-15 features a single-channel ABS. With the single-channel unit, the MT-15 retails at INR 1.36 lakh (ex-showroom Delhi), which is INR 3,000 cheaper than the YZF-R15 V3.0. Both motorcycles use a 155 cc single-cylinder liquid-cooled, 4-valve, SOHC, fuel injected engine with VVA (variable valve actuation), in the exact state of tune. The motor delivers a maximum power of 19.3 PS at 10,000 rpm and peak torque of 14.7 Nm at 8,500 rpm. Both bikes employ a six-speed gearbox that comes with assist and slipper clutch. Anchoring department includes a 282 mm hydraulic single disc at the front and 220 mm hydraulic single disc at the back. Shock absorption tasks are performed by telescopic forks at the front and a monoshock at the rear. Yamaha has announced accessories for the MT-15, and the list ranges from tank pad to mobile holder. MT branded merchandise includes Polo tees, MT logo sticker and metal keychain. Onboard footage captures the top speed and the braking performance of the new Yamaha MT-15. The motorcycle comes to a halt from 63 kph in 1.6 seconds. The Yamaha MT-15 competes against the KTM 125 Duke, TVS Apache RTR 200 4V and the Bajaj Pulsar NS200 – all of which trade at a much affordable price tag. In fact, the TVS Apache RTR 200 4V, despite the INR 1.11 lakh (ex-showroom tag), features a dual-channel ABS.